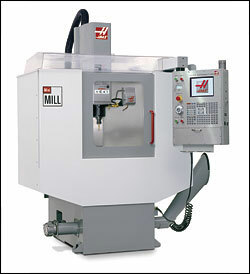 I used a Haas CNC to manufacture parts for many of my robots. Basically a roboticized mill that can be programmed to cut out parts made in CAD. I know you want one, but they cost like $100k to purchase and operate. Want one cheap? Its been asked a million times in the forum, just search! Because I don't expect the overwhelming majority of my readers to ever use a CNC, this tutorial has been left sparse. These are basic notes on operating the Hass CNC Mill taken by an 'apprentice' of mine while showing him how to use it. I will not be further elaborating on them, or teacing G-code, so this is mostly a notes dump. Sorry! Oh and btw, we use EdgeCAM to develop the G-code for the toolpaths. Spindle Warm-Up: If machine has been off for an extended period, a message will appear saying to run the spindle warm-up program. This program is found using the 'List Prog' button and loading just like the tutorial above. Slow/Stopped Coolant Flow: First check the plastic nozzle pipes you attached. Blow air hose through them. If this doesn't work, clean debris out of coolant basin underneath the CNC machine. Make sure no debris is blocking pump intake from basin. If this doesn't work, pump may have to be cleaned out. Behind the CNC machine is the pump. Unscrew the hose to the top of the pump and blow air through it. Pull out pump and make sure nothing is jammed inside. Replace pump and screw hose back on. Weak Air Hose Flow: Could be the compressed air pump. Check pressure level on pump in room to left of CNC machine room (walk out door to right). Get help with this.